Summers to Harridge, April 20, 1950: I am writing to inform you of the changes in the Washington ball park. It is rather difficult to explain but I will try to give you a picture. Maybe you wouldn’t know it from the stands on Opening Day, but the umpires spent the last bits of winter trying to make sure everything was right. Or, as right as maybe it can be, with how everything changes all the time anyway. After October, they’d get into their cars and make their way to the park – the one with the meddlesome bat rack or the one with the new screen in left center field. The one with a new iron pole standing between the bullpens, bent back out of play at a 30 degree angle, and painted bright yellow to help with seeing it. To make it possible, or at least slightly more probable, to confirm if the batter-runner should round the bases, touch ’em all, as they say. But the umps didn’t say that. The umps had so much more to say, writing long letters on hotel stationery from Chicago, Boston, Baltimore, New York, Cleveland, Detroit. You name it, if it had a park, they’d been there, walking the green of the outfield looking for trouble. Circling back on the ground brick and clay of the warning track to the dugouts – more strange surfaces, protrusions, baseball-sized holes all making their jobs that much harder. And making the ground rules a necessity. “If ball goes through wire: 2 bases.” “Bat rack is in play.” A ball hit into the ivy in Chicago is a ground rule double, unless a fielder reaches in to find it, which makes it a live ball, even if it can’t be found. That sort of thing. These discoveries – the poles, the angles, the changing location of the press photo box – these had to be accounted for so the leagues could send the batting cards, with the ground rules for each park on the B side, out to the printer in time to get them to the clubs before the start of the season. When conditions changed too late, an order of 500 cards would have to be destroyed, and 500, now corrected, were sent in their stead. This all required a great deal of correspondence. Writing and explanation. Sometimes there would need to be a drawing or two, where words would not suffice. Sometimes, what the umpires saw defied representation. There seemed to be, quite simply, no way to tell it. Dear Mr. Harridge: I did not try to draw this description as I made an attempted once before and no one understood it but me. Sincerely yours, Charlie Berry. After she died, I found a fat file of her records on the side table in their bedroom. Here, it seemed from the date on the pages, was the last CT scan and the text that came with it. The words described the tumors’ growth: they were more and bigger. And though I knew this all to be true, and I knew what it had meant because I’d been here, watching, I looked now at the scan to try to find them. I could infer a lung, maybe two. I saw variation, lines and areas of tissue, I supposed, ranging from black to white to all the greys in between. And even though I knew because I read the words and had heard the oncologist and because she’d told me: I can feel them, that they are growing back, I couldn’t see them there in the picture. I would learn what to look for in the course of a late night, as a guest on an overnight shift in a hospital not far from where she’d been born. Dr. Clayton was looking at the scan of a man who had come into the ER, and who, like my mom, had grown some tissue where it didn’t belong. I learned that what to look for was white. I stood behind the doctor and watched as the scan of the man who did not belong to me, but to a brother and sister my age, came up on the screen. Blacks and whites and greys piled on top of one another – a cross-section of his body, I guessed. But the look on Dr. Clayton’s face made it clearer: something was wrong here. I said: How do you know? And she said: Here, see this here? She pointed to a large white area on the screen, drawing her finger around to indicate its mass. And now it stood out. White, she explained, showed a density of tissue where it shouldn’t be dense, a solid mass where we should see space and variation. So now I knew. I should have been looking for white spots, the white spots would have made the picture legible. The picture, if nothing else. My mom could have told us, too: I attempted a drawing, but no one understood it but me. In the TV dramas, before surgery they are always talking about the margins. They ask: How are the tumor’s margins? I think this means: How likely is it to come out without damaging the necessary stuff around it? I think they mean: What is the margin for error? In the American League after the War, 1946 to ’52 brought a great deal of consternation about margins. The umpires and the League President set out each year to clarify in the winter the rules for the spring, and to see if the clubs had lived up to their off-season promises. Some did. Some didn’t. In New York, it took two seasons, from ’46 to ’48, to settle the issue of the Yankee Stadium foul poles, at the time a relatively recent innovation that pulled the clear edges of fair territory on the field skyward to aid the umpires in their ability to judge fair from foul on a ball shot up into the seats. To decrease the margin for error. In 1946, the Yankees’ foul poles were in the field of play, rather than in the stands, as was typical and expected. Despite the Yankee staff’s neatly typewritten letters and dashed-off telegrams assuring the League they would be moved, or at least were being looked into, the poles remained on the field through ’46 and ’47, requiring three extra ground rules and at least one reprinting of the batting order cards, until in the winter of 1948 the Yankees club confirmed this small drama would come to a close the following season. The office staff in the American League were grateful to have the matter addressed. They instructed the printer to eliminate altogether ground rules pertaining to the play of the ball off the poles, and to change Paragraph One from “Foul poles are on playing field” to “Foul poles are outside the playing field.” The removal of the poles from the field, one might think, should have made them finally unremarkable. But the change took some getting used to. Things on the ground those years were not much better, and certainly no clearer. But the Yankees couldn’t be blamed for having their minds elsewhere, for turning their attention away from the field’s particulars and toward the rough sound of Mr. Babe Ruth, who was dying of throat cancer. On April 24, 1947, Ruth, now retired, stood on the infield grass leaning on a bat belonging to a player from the opposing team, to bring his now broken voice low to the microphone. If the crowd thought he sounded bad, he assured them, the cancer – though one wouldn’t have actually said the word (cancer) in such a public way back then – the cancer felt just as bad. Here, it was clear, Mr. Ruth was saying goodbye to what he took the time to call the best sport, the only one. So we can see, now, why the foul poles might have been forgotten. Why they were left to be addressed by the ground rules, which were malleable enough. Three days after Mr. Ruth’s short address, Umpire William Summers sent the first of many letters concerning the irksome bat racks in the Yankee Stadium dugouts to the League office in Chicago. In drawing after drawing, he tried to explain to Mr. Harridge, who had his own mental image, how a ball hitting a bat stored in one of these racks might bounce fair in the course of a game. 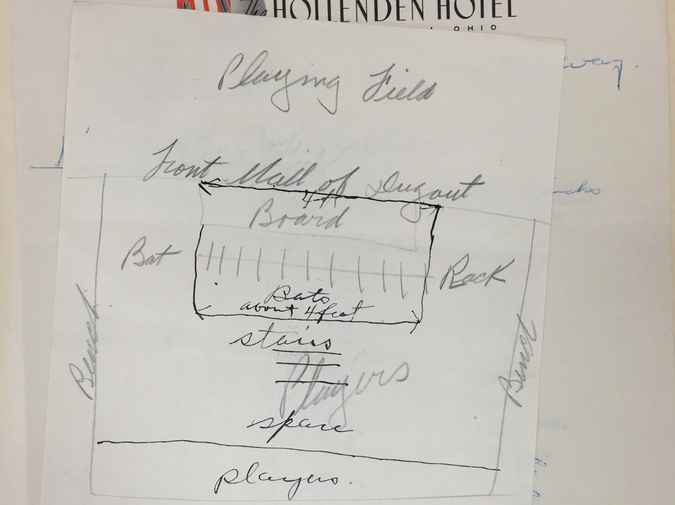 Mr. Harridge asked, if the dugout was out of play, and the rack was separated from the front of the dugout by a six inch piece of wood (which was represented in Mr. Summers’ drawings), how could a ball hitting it be in play? Mr. Summers responded: Look at the drawing this way. From my desk at the research library, I tried to look at it Mr. Summers’ way, but I also could not see it as he did. Unless what he was saying was, instead: Not even we can see everything. Not even we can freeze time when the ball, when everything, moves so quickly at game time. Compare this to Boston, though, where in ’52, the umpires wrote in sparse language, but loving detail, about the 30 degree angle and bright yellow paint introduced to the iron bar separating the bullpens behind the centerfield fence at Fenway Park. Here, they reported that what before the change would have required a telescope to see, now was plain as day. McGowan: It either hits or it doesn’t. Honochick: In the past the iron railing (post) was straight up & down (vertical). At the present time the post is bent in toward the bull pens or bleachers. If a ball should strike same I feel certain the ball would not bound back to the playing field. Duffy: Umpires McKinley, Soar, and myself inspected the bull pen prior to the start of the Sunday game. The iron rail dividing the bull pen has been slanted inward and is painted yellow to avoid confusion. With best wishes I am, Yours very truly, Jim Duffy. The umpires, who were sometimes hard-pressed to see, still had no choice but to assert, to know. A finger shot up, left or right, or twirling in a tight circle to indicate the home run. And sometimes an argument, nose-to-nose with the manager on the losing side, the one who saw things differently. These details, the small things, they mattered. So, here, Boston might have lost Ruth those many years before, but now the Yankees had lost him, too, and at least by ’52 Boston’s field was clean-edged and ready for play. Shana Agid is an artist, designer, writer, and teacher living in uptown Manhattan, with roots in the Pacific Northwest. Agid's artist's books and prints have been shown at The New York Center for Book Arts, Southern Exposure, the Minnesota Center for Book Arts, the Hamilton Wood Type Museum, and other venues. Agid's artist's books are in the collections of the Walker Art Center, New York Public Library, and the Library of Congress, among others.